The Google Data team is holding a local event for developers Thursday, December 13th, 5:00pm-10:30pm at the Googleplex (Mountain View, CA). It'll be part hackathon, part unconference, part user group, part food, and part fabulous prizes. Besides a short kick-off session, everything else will be up to you. We'll provide the wi-fi, power and food, and you can utilize the time however you want -- whether it's to pick the brain of someone on the GData team, meet other local developers, hack away on your current project, sit in on impromptu sessions about things like GData + Gears and GME, or hold your own lightning talk about the project you're working on. Head over to the GData blog for the full announcement and the event page to RSVP and for more info. changes. Check it out for yourself. WebKit is case-sensitive, JScript is not, which can lead to problems if you assume can you do things like interchange SetTimeOut() and setTimeout(). Avoid JScript-only features like collections and ActiveX. Avoid IE-specific DOM extensions, just as if you were writing a multi-browser web application. You shouldn't assume ActiveX or certain DLLs are available. Neither WebKit nor Mac OS X supports ActiveX, so these gadgets must be rewritten. Avoid Windows-only APIs such as Google Talk. These APIs are not (yet) available on Mac OS X. The Dashboard environment is very different from a web page or the Desktop sidebar on Windows in that it comes and goes as the user activates it. Don't rely on your gadget always being visible. Your gadget won't run or update when Dashboard isn't in the foreground. Don't rely on access to the file system. The security model for Dashboard doesn't allow arbitrary file access to the hard disk, although your gadget does have access to files in its own archive. Things like file pickers won't work. Note that while restricted file system access is a departure from how gadgets work on Windows, it's consistent with Dashboard's security model and the behavior of other widgets developed for Mac OS X. For more details, see Writing a Cross-Platform Gadget, part of the Desktop Gadget API documentation. If you're interested in developing your own gadget, visit the Gadgets API homepage. If you're already a gadget developer, download the beta today to test your gadget and ensure that it works correctly. Timepedia has released Chronoscope, an open source charting and visualization library, built using GWT. Auto-ranging, auto-layout of chart axes and ticks. Microformat support. Charts can be configured without programming. Server-side Font assistance. Render rotated text. Portable, Chronoscope is not tied to GWT, can be used to render from servlets, applets, or other environments. What is particularly interesting is how the Chronoscope team was able to take their existing Java source code, add 8 hours of Android exploration, and ended up with the same charting and visualization library that works on Android using their graphics support. This is one area that GWT truly shines. The fact that you write your code in the Java programming language means that you can reuse it in other places where Java runs. Being able to write one application and quickly have it run on Android and the iPhone is pretty compelling. The Google Summer of Code program has been a joint labor of love between Google and the open source community for the past three years, and the results have been spectacular: hundreds of college students have been introduced to open source software, thousands of people across the globe have begun development together and millions of lines of open code have been produced, 4 million last year alone. We've been particularly proud of this program and how much it has helped the community and we've spent a lot of time thinking about ways we can continue helping open source projects find even more contributors. Today, we're pleased to announce the Google Highly Open Participation Contest, our new effort to get pre-university students involved in all aspects of open source development, from fixing bugs to writing documentation and doing user experience research. While we're very excited about many aspects of the contest, the best part is that everyone can participate. Contestants must meet the eligibility requirements, but anyone interested in helping out can simply suggest a task to be included in the contest. Our contestants have a chance to win t-shirts, cash prizes, and a visit the Googleplex for a day of technical talks, delicious food and a photo with our very own Stan T. Rex. Want to learn more? Check out the contest FAQs and tell your favorite pre-college students to pick a task or two to complete. You can always visit our discussion group to get help or share your thoughts. Update: Fixed the broken links. 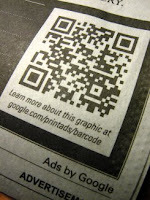 Recently in the New York Times, we placed a small graphic as part of a Google Print Ad. You aren't looking at one of those eye focus games (It's a sailboat! Or a shark!) but a two-dimensional barcode. Those of us who already know what it is pulled out our phones and "clicked" it with the camera, and were connected to the advertiser's web site. "Wha? ", you say? See http://www.google.com/printads/barcode. While this kind of thing has been a common sight in Asia for years, this ad is one of many signs that the technology is arriving in Europe and North America. But Advertising is only part of the story here. Engineering is also involved and we want to improve the quality and availability of barcode reader software available to developers and end users. So today I would like to announce the "ZXing" (from: "zebra crossing") project, an open-source, Java, multi-format 1D/2D barcode reader which can be built into a reader application for Java and Java ME -- and later, Android. This project began as a 20% project and is not yet complete, so opening it up is a bit of an experiment. It's not yet the Best Barcode Reader Ever, but it's looking pretty good. For now we want to find those those who can make use of and help improve what's here, so that those good ideas are shared to all developers and everybody wins. Developers can find the ZXing project on Google Code, and we hope you'll join us on our Google Group and tell us about what you like and don't like about the code. I just have to take a breath as I start this posting. The last couple of weeks have been a real trip as we first announced OpenSocial and then Android, both announcements that have drawn a lot of interest. Let's start with Android. We started out announcing the Open Handset Alliance and made sure people realise that this effort is bigger than a Google Phone. It is a mobile platform, with many phones to come! After some of the initial surprise we released the part that you, as a developer, care about: Android SDK. We have been astonished at the response. We now have over three and a half thousand messages on the Google Group with four thousand members. The discussion has been all over the map, from initial Eclipse setup, to discussing the sample code, to working on how to write native applications on the platform. We are so excited to see the developer interest, and can't wait to see the applications that win money from the $10M prize pool. Finally, to show how open platforms propel themselves, we got to release open drivers for the QualcommMSM7K. Just before the Android launch, we unveiled the group that worked together to create the OpenSocial APIs. We have only just begun here, and the current API is a baby 0.5 release, but it is contagious to see the container and social developers work together. Patrick Chanezon sat down and chatted with us about the new APIs and the Campfire One announcement shows you a lot. To enable developers to get containers going quickly we have put out an opensource container sample and have also seen the beginnings of Apache Shindig, another potential container. The container partners are coming online quickly. We have already seen the hi5, Ning, and Plaxo sandboxes go live and more are coming. To get a feel for the various containers and applications that have already been developed, check out video interviews that tell the story nicely. Gmail got a backend facelift and we announced a new email migration API. There are a couple of fun new open source projects announced: AxsJAX aims to make accessible Ajax applications more possible, and nsscache is an open source named services system. We put together a nice piece on a spider's view of Web 2.0 which discusses SEO principles and how Web 2.0 practices affect, or do not affect them. What about Web -1.0? That is discussed in this great tech talk on the Web that wasn't. A nice history lesson. I got to host my first tech talk at Google. I was lucky enough to pull in Steve Souders, Chief Performance Yahoo!, to discuss High Performance Web Sites and YSlow. If you want to make sure your sites run well, check out his core principles. Oh, and one other thing. The Google Code team did a huge amount of work in revamping Google Code which coincided with the major launches. We believe that the site is a lot cleaner now, and gives us a base to work on as we move forward to do a better job at serving all developers out there. Thanks for joining us so far. With hundreds (if not thousands) of popular email clients and mail servers out there, importing email into another service can be challenge, especially when you consider the troves of old email most people save. To ease this pain, we created the Google Apps Email Migration API. This new API is available in Google Apps Premier, Partner, and Education Editions, and you can use it to migrate your existing email from anywhere into Google Apps. Let's say, for example, you want to import email from your Obscurix Email Server v2.0001715. Just write some parsing code and use our simple API to upload that email into the desired mailbox. For convenience, you can authenticate to the API not only as the end user of the destination mailbox, but also as a Google Apps administrator, and target any mailbox in the domain. This API uses the Google data API protocol, which means there are a host of client libraries to make importing even easier. LimitNone (one of our Enterprise Professional partners) has already built a migration utility that works with calendars, email and contacts. For more info, check out the Google Enterprise Blog, or just dive right into the developer's guide. And please, let us know what you think! As the developer behind Fire Vox I've always wanted to make AJAX web applications truly usable for the blind and visually impaired. The challenge is that these users have to deal with a much higher learning curve than sighted users. Instead of simply learning the controls for a web application, they have to also learn how to get their assistive technology of choice to go to the interesting parts of that application to find out what is currently there. When I started as a Noogler, I was extraordinarily impressed with the tools that T.V. Raman had built into Emacspeak for efficiently performing specific tasks. An insight that I gained from watching him use Emacspeak is that the application should just say the right thing in response to user actions; users should not have to do an action in the application and then use their assistive technology to go hunting around the screen to figure out what happened. We're now excited to open-source this framework since we believe that there is nothing Google-specific in the techniques we have implemented. We invite the Web developer community to help us collectively define a robust framework for rapid prototyping of accessibility enhancements to Web 2.0 applications. The ability to rapidly prototype end-user interaction has led to an explosion in the number of AJAX applications; until now, visually impaired users have been left behind in this process. We hope that the AxsJAX framework encourages the Web community to bring the power of Web 2.0 development to solving the problem of accessing rich Web interaction in an eyes-free environment. Many of those subscribed to this blog have heard our recent announcement about the Open Handset Alliance, and we thought we'd bring everyone up to date. Today, the team released an early look at the Android SDK for developers interested in building applications for Android. By the way, we've released more than just the SDK. Those of you who follow the development of the Linux kernel on ARM may have seen that we released our initial patches that provide kernel support for the QualcommMSM7K. This release means that support in the Linux kernel is now available for the on board serial, i2c, timer, NAND flash controller, MDP/MDDI framebuffer, gpio controller, and high speed USB client controller. This code also provides access to the baseband features of the chip. The announcement to the kernel developer community can be found on the ARM Linux mailing list. Like all proper Linux kernel code, these patches were released under v2 of the GNU GPL. Stay tuned for more open source related details. We're really excited about all of these developments and can't wait to see what results. To help get things started, we've also announced the Android Developer Challenge, a $10 million challenge to reward developers for working with the platform. Head over the Android Developers blog to find out more about this exciting mobile platform. The announcement of the OpenSocial project is really exciting, so I was really glad to drag Patrick away from his work to take some time to chat with me about it. Patrick is easy to talk too, and I think that comes across in the interview itself. There has been a lot of pre-release speculation on what OpenSocial really is, and the press has put out wildly different ideas over the last couple of weeks. Patrick lays out the facts of the announcement. What it means to be an OpenSocial "container"
Sit back and listen to Patrick's dulcet French tones as he takes you through all things OpenSocial. Also, check out video from the Campfire One event and interviews with a subset of the partners involved in the OpenSocial launch. Having a large number of application developers and container vendors show what they have already done gives you a glimpse to the future. Now I want to record the next podcast by the fire. When Vic asked me to organize a campfire on campus, at first I thought he was joking. But when he kept asking how big the fire was going to be, I quickly realized he wasn't. Thus Campfire One was lit. Campfire One is a means to share product announcements with lots of people in a way which keeps pace with Google's release cycle. We invite a few people to campus and record our news for the web. There's no Campfire Two, just another Campfire One in the future. The 'One' signals that we've flipped the bit on something we think is worth sharing. By the way, did you know that oak on a campfire is supposed to smoke less than fir? I don't think some of our presenters believe it. You might say we had a bit of a real 'smoke test' before rolling the cameras. In 2005 we launched Google Code to provide a home for our developer and open source programs. Two years, dozens of new products and new programs, and one major redesign later, Google Code is bigger and more dynamic than ever. With today's relaunch we've added a new search auto-complete feature (to help you find your favorite products with a keystroke or two in the search box), an expanded and improved search results page, a cleaner and more comprehensive site directory, new blog and group gadgets, and a simplified and unified look and feel for product documentation. To get a sense of how far things have come you can take a look at the first version of Google Code, back when the whole site almost fit on one page. Today we have thousands and thousands of pages of content on Google Code, and we've added the new site directory and new search features to help you navigate them. But the best thing about Google Code hasn't changed: And that's you, the developer, our never-ending source of inspiration. Your projects provide countless examples for the Featured Projects feeds, your words and wisdom power the developer groups, and your accomplishments and ideas never cease to amaze us with the possibilities and potential for a better web. This redesign was for you, and I want to personally thank all of you for being such an integral part of Google Code. Together we're capable of doing something very special. Please join us on the Google Code Blog, (where we'll be enabling comments for this and future posts), and let us know where you're headed and how we can help you get there.